The world is on the brink of total collapse. Already devastated by a terrible plague, much of the globe has gone dark. Small groups of survivors struggle to keep the world alive, but their efforts are no longer enough. The world needs leaders to rise up and find the way back from the brink of extinction. That task has fallen to you. You must find a way or nobody will. You are humanity�s last chance. 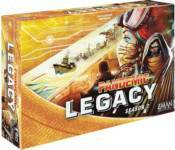 A cooperative legacy game for two to four players, Pandemic Legacy: Season 2 immerses players in a harrowing tale of survival. It is seventy-one years after the events of Pandemic Legacy: Season 1, and humanity has been brought to its knees. A network of the last known cities persists, supplied by the �havens,� isolated stations floating in the ocean far from the plague. Three generations of survivors have called the havens home. Most of them have never set foot on the mainland. But now supplies are running low and the people have turned to you to lead. It is up to you to save what remaining cities you can and stop the world from ending for good. Over the course of a year, you and your team must search for answers to the vicious plague while maintaining your supply network. Your actions will carry over to future games and your choices will forever alter the world. Cities will rise and fall, your characters will learn new skills and may become permanently scarred, new rules will come into play, and the very game board will be forever altered. Each development affects the course of your group�s unique journey through this post-apocalyptic world and contributes its own twist to your story. The havens are the only home that you�ve ever known, but there is a larger world out there, and it needs your help.